There’s a whole new way of talking about what you do. It’s not salesy. It’s not braggy. It’s personable and genuine and authentic. It’s you. The engaging and memorable you. I want you to rip out pages 52 and 58. Put them on the desk next to the book so you can roll up your sleeves and actually work through the exercises. Scribble ideas in the margins. There are examples for insurance agents, mortgage brokers, lawyers, life coaches, IT professionals, and more. Highlight the examples that sound good to you. But don’t use them. Use the exercises to come up with your own unique approach. For years I ran the in-person Elevator Pitch Workshop. Then I figured out how to do an online version. How to provide that personalized workshop environment in a webinar format. Now I’ve condensed that 90 minute program into 60 pages. That’s right. Just sixty 5″ x 7″ pages. We’re not talking about weeks of work. Or even hours. In fact, I can usually get people to a brand new Elevator Pitch in just 10 minutes. More about that in a minute. Most books don’t offer a guarantee, but most books don’t offer a tested and proven process for talking about what you do in a way that gets other people excited about what you do. It’s worth experiencing. So take 60 days. Just one catch. If you ship me back a new book, there’s no refund. Because this book doesn’t work if you read it. It’s a workshop. You have to do the work. You have to write down the exercises. You have to try it out at networking events. But before you send me back a book with the pages ripped out, scribbles in the margins, and highlighter everywhere, two things. Before you send it back to me, I’m inviting you to experience my 7 Word Elevator Pitch Group Coaching program. I usually charge $29 for this program, and when you purchase my book you can attend as many of these programs as you want for free. That’s right. Just email me your receipt and I’ll get you on the guest list. You get live access to me in a group environment and we work on everyone’s Elevator Pitch. Right there live on the call. It’s a really fun process, and I encourage you take advantage of it while I still offer the program. So here’s the thing. I’m getting my distribution center set up. Right now I have a couple of boxes of books left in my closet. And the cool thing is that while I’m still shipping them, I can sign them for you. Once the distribution center gets going I won’t be able to do that anymore. 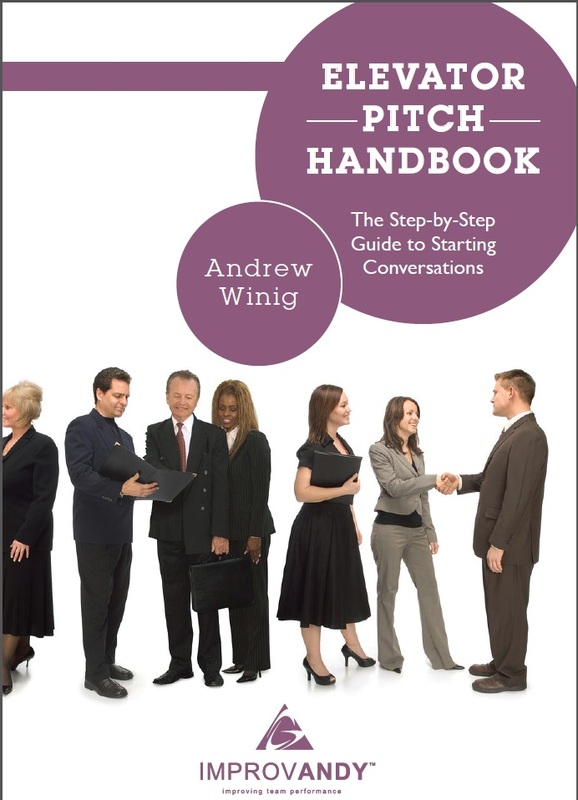 So here’s your chance to get a signed copy of my book, a brand new Elevator Pitch that sounds like you, attracts the right people, and is fun to say, and a lifetime free pass to my 7 Word Elevator Pitch Group Coaching Program. All for just 29.95 plus shipping. You just haven’t learned to express you passion in a way that makes people eager to talk to you. We show you how. Step-by-Step. Click on the Table of Contents below for a preview. Buy 4 Books, Get One Free!